Item #ARS-128987: Adjustable 17"-19" 10Kt. White and Rose Gold sideways crossnecklace with round Diamond of .01 Cts. and spring ring clasp. Item #ARS-128445: 17"-19" long 14Kt. Yellow Gold Necklace with Sideways Cross with Round Diamond of .02 Cts. ; Spring ring clasp. 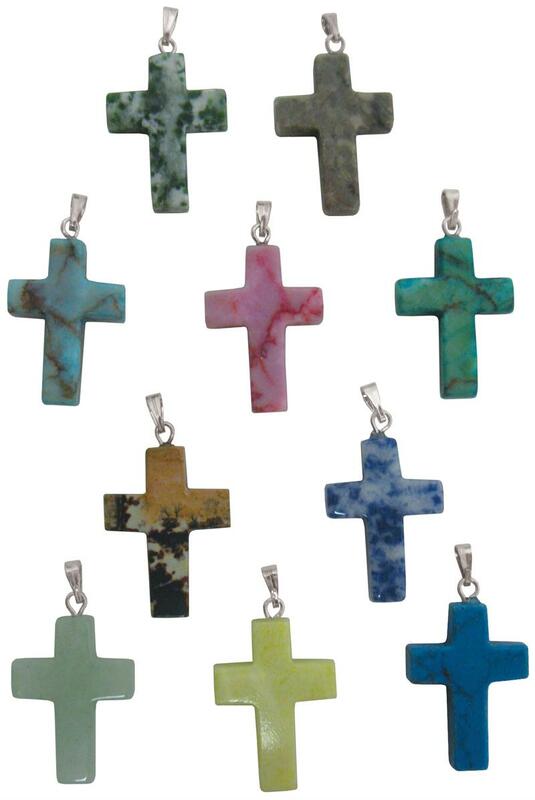 Item #IGM-T3012711098: Lot of ten 22x30mm assorted Gemstone cross pendants with silver-tone bails. Lots vary and may include assorted natural and dyed Jaspers, Agates, Quartz, Howlite, Epidote and other materials. Item #SC-PTCP-180: 14Kt. Yellow Gold Cross pendant with "AA" quality 5mm round Akoya Cultured Pearl and five round Diamonds of .03 Cts. TW. Item #SC-PTFG-0997-S1: 1/2" long 14Kt. Yellow Gold Cross Pendant with six prong set 2mm round Red Garnets of .25 cts. TW. Item #SC-PTTA-0623-X1: 14Kt. White Gold cross pendant with sixteen 2mm round Amethysts of .56 Cts. TW & fifteen 2mm round Blue Topaz of .72 Cts. TW. Item #D&R-24052: 18Kt. Yellow Gold Cross Pendant with six prong set round Amethysts of .64 cts. TW. Item #SC-PTBO-0262: 3/4" long 14Kt. Yellow Gold Cross Pendant with Black Onyx. Item #SC-PTFB-0997-S1: Petite 14Kt. Yellow Gold Cross Pendant with six round Blue Topaz of .22 cts. TW. Item #DR-15347: 7/8" long 14Kt. Yellow Gold Cross Pendant with eleven prong set 3mm Round Citrine of 1.16 cts. TW. Item #4UD: 3/4" x 1 1/2" long 14Kt. White Gold "Tears for Me" Cross Pendant with bead set Round Diamonds (G/SI1 quality) of .30 cts. TW. 3.18 Gms. TW. Item #ARS-PD2680-WRG: 7/8" x 1 3/8" long 14Kt. White & Rose Gold Cross Pendant with thirty Round Diamonds of .50 cts. TW. Item #AD-143646: 7/8" x 1 1/2" long 14Kt. White Gold Cross Pendant with thirty-three prong set Round Diamonds of .33 cts. TW. Item #ARS-PD3143: 5/8" long 14Kt. Yellow Gold Cross Pendant with five channel set Round Diamonds and four Round Diamonds prong set in White Gold of .10 cts. TW. Item #SC-PTDA-1223-YX1: 15/16" long 18Kt. White Gold Cross Pendant with forty-eight prong set Round White Diamonds of .58 cts. TW and six Round Yellow Diamonds of .05 cts. bezel set in Yellow Gold. Item #SC-PTDA-0208: 3/8" X 1/2" long 18Kt. White Gold Cross Pendant with twenty-eight pavé set Round Diamonds of .25 cts. TW. Item #SC-PTDA-0219: 1/2"x3/4" long 18Kt. White Gold Cross Pendant with sixty-seven pavé set Round Diamonds of .45 cts. TW. Item #17095: 10Kt. Yellow Gold Cross Ring with Round Diamonds of .05 Cts. TW set in White Gold; Size 6 3/4. Item #SC-ERDA-455: 14Kt. Yellow and White Gold Heart shape Earrings with eighteen pavé set Round Diamonds of .09 cts. TW in Crossed Hearts Design. Post backs. Item #SC-PTDA-0306: 3/4" x1/2" long 14Kt. Yellow and White Gold Heart shape Pendant with nine Round Diamonds of .05 cts. TW pavé set in White Gold in Crossed Hearts Design. Item #QG-XWR138: 3/4" x 1 1/8" 14Kt. White Gold Filigree Cross Pendant with bezel and bead set Round Diamonds of .55 cts. TW. Item #TBM-E54-BG6P63D: 7" 14Kt. Yellow Gold sideways cross bangle bracelet with round Diamonds of .16 Cts. TW. 2 3/8" inside diameter. Item #17280: 14Kt. White Gold Sideways Cross lady's ring with round Diamonds of .14 Cts. TW. Size 6 1/4. Item #17252: 14Kt. Yellow Gold Sideways Cross lady's ring with round Diamonds of .10 Cts. TW. Size 6 1/2. Item #TM-E67-NP3637: 15 1/2"-17" 14Kt. Yellow Gold Sideways Cross necklace with thirty-nine round Diamonds of .10 Cts. TW. Item #EI-3: 18Kt. Yellow Gold cross pendant measuring 16.5x19.3mm with four rectangular & two square Emeralds of 1.24 Cts. TW and three radiant cut Diamonds of .10 Cts. TW. 4.06 grams TW of piece. 4.06 grams TW of piece. Item #ARS-PD2271G: 14Kt. White Gold Cross Pendant with 3x5mm oval Garnet of .33 cts. and four round Diamonds of .02 cts. TW. 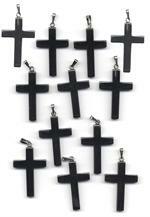 Item #IGM-HC-10: Lot of twelve 22x34mm Hematite cross pendants with silver tone bail. Item #SS-2086: Handcrafted Indiri Collection Sterling Silver Bali cross pendant with checkerboard faceted 9mm round Smoky Quartz & four 7x14mm oval Sky Blue Topaz. Item #D&R-30978: 18Kt. Yellow Gold Cross Pendant with six prong set 4mm square Iolites of .70 cts. TW. Item #CFX-12: 4.5" tall, assorted natural colors Mexican Onyx Cross. Item #CFX-9: 3.75" tall, assorted natural colors Mexican Onyx Cross. Item #CFX-12: Twelve, 4.5" tall, assorted natural colors Mexican Onyx Crosses. 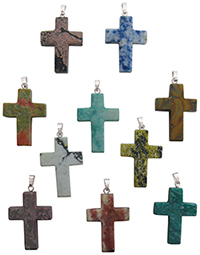 Item #CFX-9: Twelve, 3.75" tall, assorted natural color Mexican Onyx Crosses. Item #TM-22324: 14Kt. White Gold Cross Pendant with Peridot, Blue Topaz, Citrine & Amethyst and six round Diamonds of .04 cts. TW. Item #PC-400-P: 14Kt. Yellow Gold cross pendant with five 3mm square Peridot and six 3mm square Golden Citrines. Item #D&R-24717: 18Kt. Yellow Gold cross pendant with checkerboard faceted 4mm square Peridot and three 6x6mm & one 6x9mm checkerboard faceted modified cushion Peridots of 4.66 Cts. TW. Item #D&R-31383: 14Kt. White Gold cross pendant with four pear shape Pink Tourmalines of 1.48 Cts. TW and one round Diamond of .02 Cts. Item #D&R-28847: 18Kt. Yellow Gold cross pendant with one each faceted 5.5mm cushion checkerboard Garnet, Amethyst, Citrine, Peridot, Iolite and Blue Topaz. Item #SC-PTRB-99-X2: 18Kt. 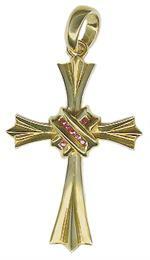 Yellow Gold Cross Pendant of 7.44 grams with seven channel set round Rubies of .08 cts. TW. Item #CH-DER-E503: 18x25mm Sterling Silver Southern Gates filigree cross earrings with shepherd's hooks. Item #CH-DER-P929: 24x30mm Sterling Silver Southern Gates filigree cross pendant. Item #QG-QC6661: Sterling Silver reversible "The Lord's Prayer" cross pendant.